The rail network plays an essential role in transport infrastructure worldwide. A ballasted track is commonly used for several reasons, including economic considerations, load bearing capacity, rapid drainage and ease of maintenance. Given the ever-increasing demand for trains to carry heavier axle loads at greater speeds, traditional design and construction must undergo inevitable changes for sustainable performance. Ballast is an unbounded granular assembly that displaces when subjected to repeated train loading affecting track stability. During heavy haul operations, ballast progressively deteriorates and the infiltration of fluidized fines (mud pumping) from the underlying substructure and subgrade decreases its shear strength and also impedes drainage, while increasing track deformation and associated maintenance. 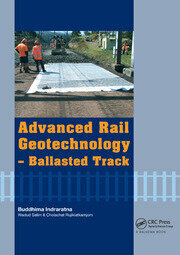 serves as a useful guide to assist the practitioner in new track design as well as remediating existing tracks. research discussed in this book has made considerable impact on the railway industry. resulting from collaborative research between academia and industry, incorporating sophisticated laboratory tests, computational modelling and field studies. 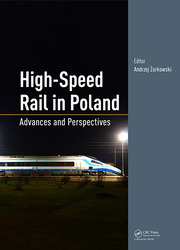 This book presents a comprehensive procedure for the design of ballasted tracks based on a rational approach that combines extensive laboratory testing, computational modelling and field measurements conducted over the past two decades. 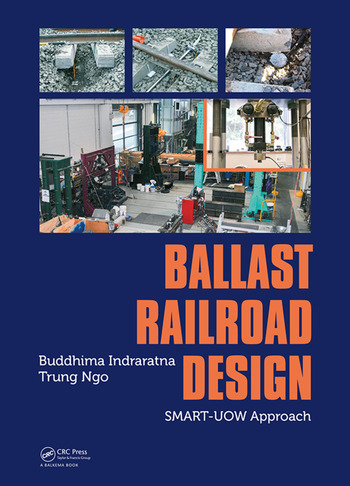 Ballast Railroad Design: SMART-UOW Approach will not only become an imperative design aid for rail practitioners, but will also be a valuable resource for postgraduate students and researchers alike in railway engineering. Buddhima Indraratna is Professor of Civil Engineering at the Centre for Geomechanics and Railway Engineering at the University of Wollongong, Australia. Trung Ngo is Research Fellow at the School of Civil, Mining and Environmental Engineering at the University of Wollongong, Australia.